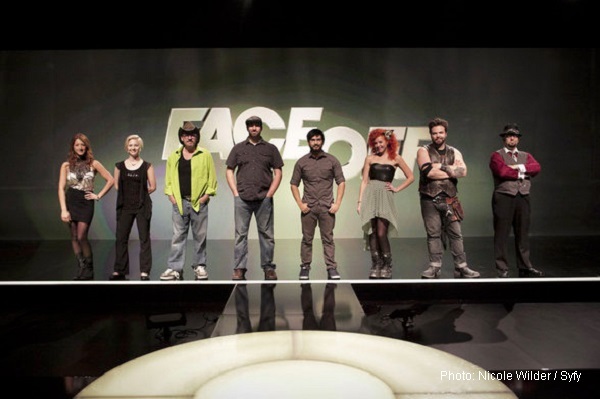 The fifth season of Syfy channel’s VFX reality competition show, “Face Off” is the first season that will feature eight new contestants and eight returning contestants to compete for a chance to win the grand prize. The first episode, “Tailor Made” of season five premieres Tuesday, August 13 at 9 pm. 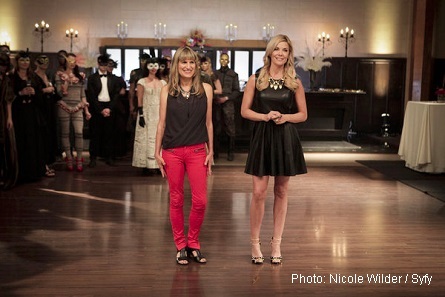 During an interview with host of the show McKenzie Westmore, and one of the judges Glenn Hetrick, Westmore said in regards to bringing back past contestants, “every season we constantly have to go bigger and better and it was time for a little shake up . It was time for a twist. In the first foundation challenge of the masquerade ball is each man for himself. After that, Westmore said the show will be divided here and there with the newbies versus the vets. Not even Westmore knew that this season would include “Face Off” veteran contestants. She said, “I didn’t know until the night before that there would be eight veterans. The newbies didn’t know. It was a big shock.” She said that in the challenges, it switches back and forth. One week it will be different for a newbie, then one week it’s different for a veteran. Catherine Hardwicke, director of Twilight comes in for first Foundation Challenge. Also joining in the first episode is the Heroes of Cosplay – the new documentary series on Syfy. Other guests in this season are: Bill Corso (Academy Award-winning makeup artist), Kevin Grevioux, Lin Shayne, Jordu Schell, Elvira, Valli O’Reilly. Dave Salmoni of “Animal Planet” comes in for a special challenge that is an animal and human hybrid. McKenzie’s Academy Award winning make-up artist father Michael Westmore will also be returning this season as an adviser. Hetrick said, “not that we expect for veterans to do something different than what the newcomers are doing but there’s also the added aspects of this challenge where the newcomers are coming in and they have the benefit of adrenaline.” Hetrick said overall, the only benefit that the veterans really have over the newcomers is that they are familiar with the lab. Hetrick said the vets that showed the most growth this season is Miranda. He said that with the veterans, the fear of being thrown-off once is gone, and they’re more comfortable exploring their vision. The trick to challenges is they have to come up with something that’s big, but doable in the time frame allotted on the show. With the right amount of time management that they have time to paint. Hetrick said, the sculpture may be beautiful, but then they don’t leave the time to paint it. Some challenges this season will include Frankenstein, and Morelocks. What challenge would Westmore and Hetrick like to see on the show? Westmore said “I would love to see a Broadway challenge. Something along the lines of Shrek. Something where the models have to sing through the challenge. I might even volunteer to be the model on that one!” Hetrick said hes’ like a challenge that is all horror literature inspired. “Like Edgar Allan Poe. Paying homage to.” He said it’s a good way to expose the audience to his favorite literature and getting back to it.